In early October (2018) I was tagged in a post by an amazing woman whom I’ve never met in Real Life but we are ‘Friends’ on Instagram. 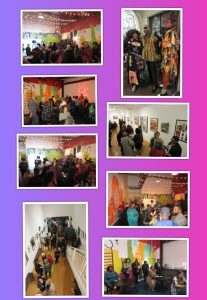 Mareesha (@Pretty_Paralegal) shared with me a post by R.A.P (@RushArtPhilly) regarding an event that was going down, Saturday, November, 3rd 2018 in Philadelphia, PA. This event would be hosted by, Angela, Vanessa & Jo-Jo Simmons. 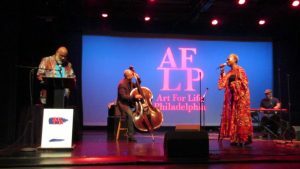 The post basically was asking for Media and Bloggers to contact them if (we) were interested in covering the ART FOR LIFE, PHILLY fundraiser. I sent an email and a few weeks later I received a response letting me know I would be given PRESS Access to the event. I was so excited and honored. *Please Note, these and more are currently available for biding until 12noon (EST) 11/15/18. Danny Simmons informed us, the 1st Artist in his life was his Mother. He remembered her with the desk easel and the smell of oil paint. Because this was his 1st Fundraiser, he dedicated this event to her. Danny Simmons, along with his 2 brothers (Rev.Run & Russell Simmons) started Rush Philanthropic Art Foundation 25yrs ago. 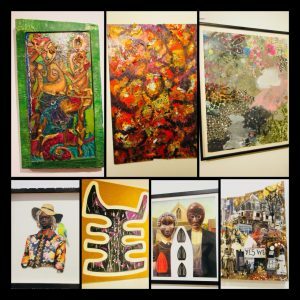 He seen a need for a center that worked with Emerging Artist, Artist of Color, Women Artist as well as a place for children to come and learn Art. 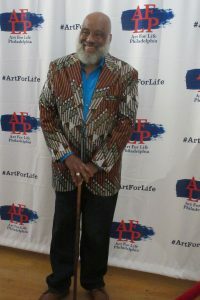 A few years ago after traveling back and forth in hopes of expanding the foundation, Danny Simmons had an exhibition show at the African American Museum. That show had him coming back to Philadelphia often until one day, on a whim, he decided to pick up and move to Philadelphia. After he got settled, he wanted to open up an Art Gallery. Eventually he found an old bank and turned it into Rush Art Philadelphia (RAP). It’s currently in its 3rd year. As guest arrived, we all mingled, snapped shots and took pictures using ‘Center City Photo‘ booth who was one of the Sponsors. 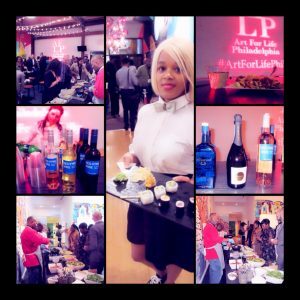 Other sponsors included Todd Agostini, Health Partners Foundation, Jaguar, Land Rover, BlueCoat American Dry Gin, Harlem Brewing Co, Heineken and Straight Outta BROOKLYN, One of my favorite Wine brands, BED-VYNE Brew (385 Tompkins Ave, Bklyn NY). When it was time to start, we entered the theatre where we were greeted by Vanessa, Angela and Jo-Jo Simmons. Before they brought their uncle Danny out, they Thanked us for coming out and being supportive. Then they all let us know what was in store for the rest of the evening. 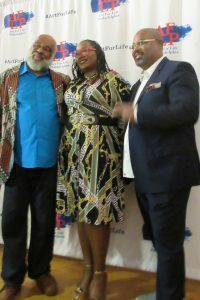 They brought Danny Simmons out, along with Lenny Bazemore, Event Chair, Taneshia Nash Laird and after they came on stage, Danny Simmons brought out Ms. Dyana Williams who would help bring out the Honorees for the evening. The 1st award, “The Judy Brodsky Award,” went to Print maker, Professor and Art Advocate, Ms. Judy Brodsky. 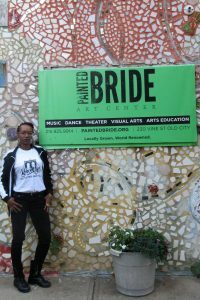 Ms. Dyana Williams let us know, Judy B. has Artwork in many Museums all over the world. Such places like London, Berlin, New Jersey, Harvard as well. She has many degrees from various schools including, Philly’s own, Temple University (TeeeYooou). Danny Simmons told us she was a new friend of his. Someone he had been hearing about for many years due to mutual friends they shared. He informed us about all the work she’d been doing for a long time. When Judy Brodsky came up to accept her award, she said a few words and it really gave me a different view of Art in general. She started her art career in Philadelphia. 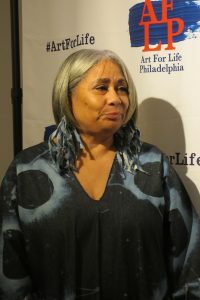 In the 1970’s, she used art in conjunction with Social justice and started an organization called “Philadelphia Focuses on Women Individual Arts.” From what she described, it was an interesting movement. 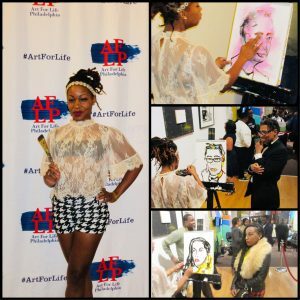 I can’t wait to learn more about what she is doing for and in the art community. Especially regarding Print Making. She believes all artist should get into Print Making. The next person to be honored was Philadelphia’s own, James Brantley. He was honored for his unique artistry and significant cultural impact. 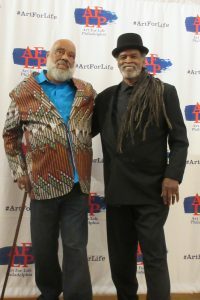 James Brantley was one of the first artist Danny Simmons met when he moved to Philly. An instant friendship was formed. When Mr. Brantley came up to accept his award, he Thanked Danny Simmons for his contributions to the Art Community. He also let us know about the work he does in Philadelphia for the youth. James Brantley told us his inspiration into Art was his father. He let us know, “Art is the foundation of civilization.” He added, “Art has had something to do with almost everything you touch.” I believe that completely. When you think about it, its the truth. He knows he will be involved with Art for the rest of his life. 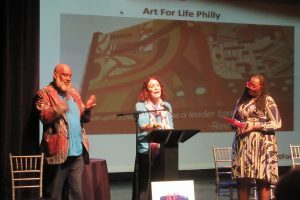 The last person honored was Jane Golden (@JaneGoldenMuralArts). 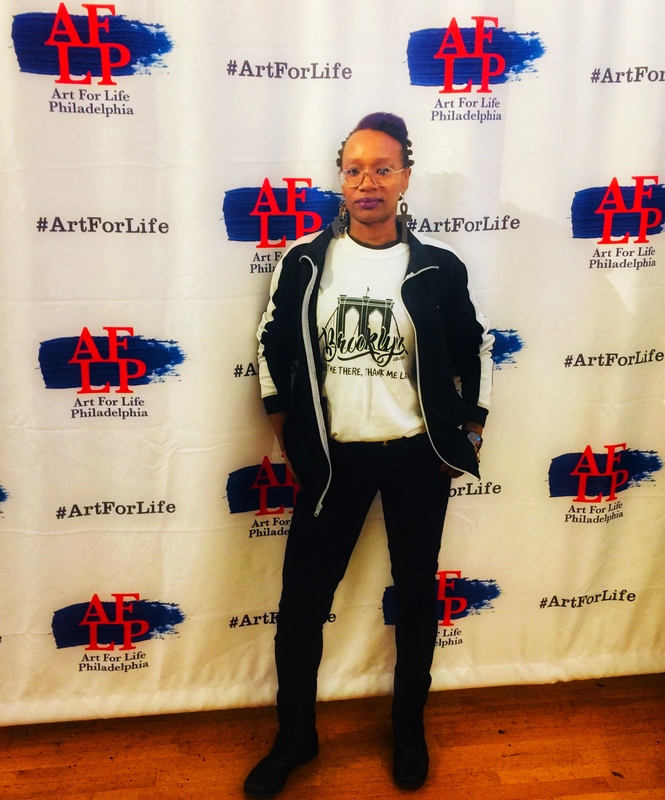 She is the Founder and Executive Director for MURAL ARTS (https://www.muralarts.org/) She was someone I was excited to meet and hear more about because I have a huge love for Art Murals. “Mural Exploring” (I call it) is something I enjoy doing when I come to Philly. The murals around Philadelphia are Amazing. What a difference a Mural makes when its in a neighborhood. The colors, the messages, and even the love and time put in to it by the artist. Jane Golden even reached out to Grafitti writers to help rechannel their creativity. 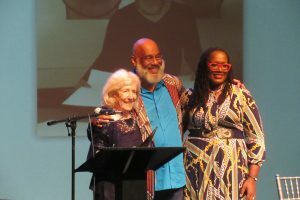 She was being honored for her commitment to art education and her ground breaking rolls in community development. Danny Simmons said he was Honored to be able to give her an award. 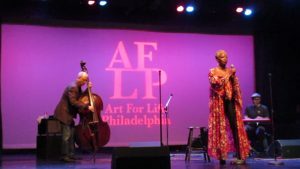 When Jane Golden came up, she had us close our eyes for a moment and imagine Philadelphia without the 4,200 murals around the City. I couldn’t pull myself to do it because the thought alone is horrific. After the awards were given out, there was an intermission so the guest could mingle some more but I had the pleasure of going to the PRESS ROOM so I could, along with the other Media/Vloggers/Bloggers, have a chance to interview Vanessa, Angela and Jo-Jo Simmons. We were eager to know what they had coming up in the future. I stood there for a bit and remembered how I was in support of Black Girl Magic when my youngest was about 3yrs old. I was a consistent purchaser of PASTRY sneakers, which was a Sneaker brand the Simmons’ sisters had. The style was so vibrant and colorful. Much like them in Real Life. 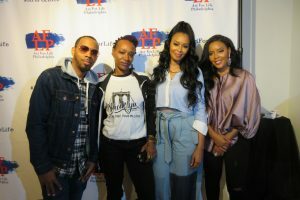 Angela Simmons let us know she was happy to be able to be there for her Uncle Danny. She said, her uncle was inspiring to her. He was the reason she was creative and into the Arts now. He always brought great energy around. The gifts he gave, like books and art pieces on (our) culture meant a lot. Uncle Danny did Any and Everything to keep them All creative. Angela said she realized as a child from visiting many Art Galleries that she could combine fashion and art into being a designer. She said as a parent, when it comes to teaching creativity, it opens the mind up of a child. Without art and without being creative she wouldn’t be where she is today. Art is a part of mental growth, she added. I’m excited for what she has in store for the future, like, “Pressure makes a Diamond,” which will be a Women Empowerment initiative movement under her non-profit organization, “Angela’s Angels” as well as a clothing line dropping called, BONNIE BOUCHE (http://bonniebouchebrand.com/ ) So Stay Tuned! 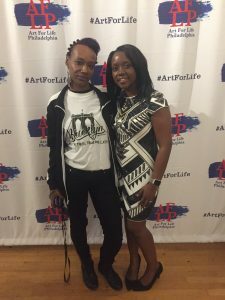 Vanessa Simmons said ART FOR LIFE foundation means so much to her because its keeping art in the community where kids have access to something they may not have anywhere else. She said, “It would be a sad world without art.” I agree. Vanessa informed us, the 3 of them would be returning on the reality tv show, “GROWING UP HIP HOP” which is coming back January 2019. She is also coming out with a BODY & BATH line to empower women to be more Relaxed and work on Self-care. Vanessa is also involved with a pageant in California, so stay tuned for that. Jo-Jo Simmons said “I always feel better when I Give than Receive!” When it comes to being a father, he said, “when u start teaching kids art at a young age, it gives them limitless opportunities.” Their imaginations become wider. Jo-Jo has started a brand called, #DaddyCommittee to help fathers with special ‘Daddy gear’ as well as Diaper bags, and more, to help with parenthood. He also started his own label called #WhosHouseEnt. which combines with his non-profit organization where they take teenage kids across the world for FREE playing basketball. He has music coming out, too. I can’t wait for that. They all stressed what an honor it was to be a part of such an amazing event. They were happy to be there to help their uncle. I could feel the love they had just by the way they discussed more about the foundation and what they learned from Danny Simmons. 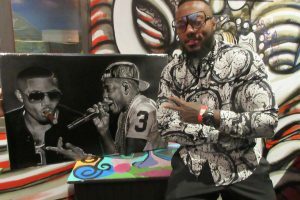 Another Dope Artist I met is someone I plan on purchasing from and having his artwork hanging on my “HipHop” wall at home. His name is Justin Wadlington (@JustinWadlington). He came through with a piece he donated to the fundraiser. For me, its a Must Have! It was a picture of Nas and Jay-Z. He said it was done with pencil then printed. I don’t know how I’d never heard of him before. Especially when I immediately started following him on Instagram, then it showed people I am friends with on IG who already follow him. When it came time for the entertainment, I was blown away! 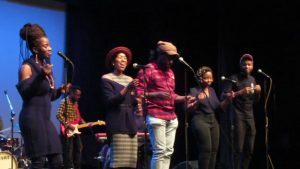 MusiQology stepped on stage and sang an original song with a live band. MusiQology had all the ladies swaying their hips and the men, tapping their feet on beat to add to the sounds. This entry was posted in PROMOTIONS, WHAT'S THE WORD. Bookmark the permalink. Great event to get invited to, especially being the first year. Very descriptive coverage of the events I felt like I was there. Nice job. Thank you for reading. It was very nice. I cant wait to go back to Philly and visit some more art galleries as well as seek out the latest Murals around town. Thank You so much. I have so much more coming soon in the New Year! Thank you for taking even a second to check me out. You are appreciated. What an amazing event!! This is an event I would have loved to attend with you. Maybe one day we can go on a mural tour together – Philly has such amazing murals, but I didn’t know there were 4200of them! Wow! WoW! Awesome, I missed this event. I live in Philly but was on a nearly non – stop work schedule. You’re coverage is great. Awesome job! Yes, it was amazing. There will be more events like this coming up in the future. Be sure to follow @rushartsphilly on IG and me as well @BklynTyeNYC bcuz I will also post upcoming events. 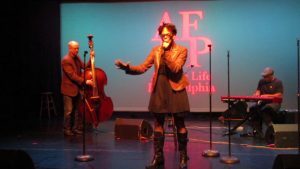 As a heads up, theres a Def Poetry Jam coming up in April. Stay tuned.